Few parish churches have been so effectively squeezed out of existence as St Mary. But here, in the endless western suburbs of Felixstowe, it was clearly the least sustainable of all the eight Anglican parish churches in the urban area. Changing patterns of worship are even more fickle than those of population, and in this most evangelical of all Suffolk towns, worshippers have been pulled in by the excitement of the Cavendish Community Church a mile or so away (now born again as Christ Church). There is also the glamour of the central Felixstowe churches; Suffolk's flagship Anglo-catholic experience at St John the Baptist, and the rugged protestantism of St Andrew. 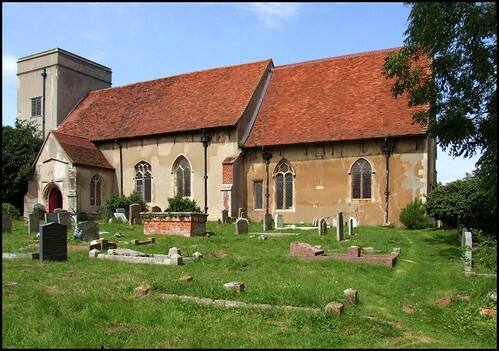 St Mary's main problem is that it sits in the same churchyard as its neighbour St Martin - or, more accurately, in adjacent churchyards with the dividing wall now gone. Any potential congregation was similarly divided, and so in the 1980s St Mary was effectively closed, St Martin becoming the parish church, and this one a multi-purpose community building, a recreational space with facilities for playgroups and the like.St Mary was never formally declared redundant, and is still techinally one of two churches in a joint parish. However, in recent years it has been kept pretty well permanently locked. I got into terrible trouble once for saying that this was quite the ugliest church tower I knew, with all the glamour of an electricity substation, but it has had its rendering renewed in recent years, and looks rather spick and span after all. And the nave and chancel against it is pleasant enough, and clearly loved. Much survives that is apparently 14th century, but this church, like neighbouring Walton, was a complete ruin by the 19th century, and so what we see is essentially a Victorian rebuilding. I pass this building on a fairly regular basis, and as is the way with these things I had put off trying to get inside to take any photographs for years, concentrating my mind on more remote but more accessible quarries. Adjacent St Martin is also always locked without a keyholder, and so is nearby Walton church, and generally this is not a part of the world which is particularly friendly to church visitors. However, I was out cycling this way with a friend in the late autumn of 2008, and I was intrigued to see a large sign outside saying Church Open: Model Railway Exhibition. We hauled our bikes up the path, and went inside. A table had been set out the length of the nave with model railway layouts on it, and several men were standing behind studiously pressing buttons and flicking switches. It was a little bizarre, although not as odd as the Ipswich town centre church of St Peter, which was filled with model railway layouts for more than ten years in the 1980s and 1990s. I asked one of the men if I could take some photographs of the windows. He said yes, and without further thought I started pottering about. I suppose I had been in the process of photographing for about twenty seconds, when suddenly a rather short and angry man came and stood in front of me. "Who are you, and what are you doing?" he demanded. Now, knowing my rights, as they say, and having asked for and received permission, I wasn't about to crumble. I asked him who he was, and why he wanted to know. Raising the pitch and volume of his voice, he took a step towards me. "I am the churchwarden! Now, who are you, and what are you doing?" Well, that seemed reasonable enough. I introduced myself, and explained my project. I have to admit that, while preserving an outer impression of sang-froid, I had been rather shaken by his aggressive attitude, but I was aware that this might well be the only opportunity I got to photograph the windows. He in turn seemed to regret being quite so forceful, and soon he was going out of his way to be helpful, moving boxes and even offering to put the lights on. Perhaps it was just as well he didn't know I'd once commented on how ugly his church tower was. What I hadn't known, and what made the whole traumatic experience worthwhile, is what a super collection of late 19th and 20th Century stained glass this church has. The best is the fabulous east window with Christ the King flanked by censing angels. It looks as if it should be by Powell & Son, although Sam Mortlock observes that the maker has not been identified. Similary, several figures in the nave are very like the work of Kempe & Co, but without the familiar wheatsheaf signature and tablet. Best of all, I liked the memorial windows to the locally famous Cobbold family, which depict two of their number as St Edmund and St George - Mortlock gleefully noted the incongruity of their walrus moustaches. The chancel is screened off from the rest of the church by a large curtain. It has rather a disused feel, but it could probably be restored to some kind of liturgical use fairly easily. The last time I had been inside this church, some ten years previously, I had found it used to store junk, but this has all gone now. The churchwarden and I were now getting on splendidly, and I ventured a query as to how I might get to see inside St Martin next door. As I'd hoped, he not only had a key with him, but offered to come and open up. As is the way in a large suburb like this, St Martin is in regular use for weddings, and there was one scheduled for that afternoon, but we might just go and take a look. I had one last wondering gaze around St Mary - who knows how long it might be before I saw inside again? - and we set off the short journey of thirty metres or so to the church on the other side of the graveyard, wondering what treasures might await us there.